The encouragement and backing from our community has got the WW1 FPS games Verdun and Tannenberg to where they are today. We’re looking forward to continue supporting both games, and the 1914-1918 WW1 Game Series. And above all, our sincere gratitude! This historical game takes place across the lakes, forests, and snowy plains of the Eastern Front - it was inspired by the Battle of Tannenberg in 1914 where the Russian Second Army was dealt a heavy blow by the Germans. 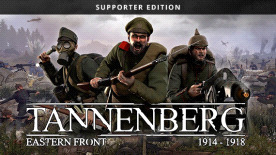 Tannenberg offers a range of game modes - including the exciting new mode reflecting the different nature of war on the Eastern Front - and a wealth of historical detail: realistic WW1 weaponry, authentic uniforms, horrendous gore, and maps based on real battlefields, this time in the forests, plains and mountains along the border between the Russian Empire and the Central Powers. It's all-out war on the Eastern Front! From artillery barrages and poison gas to the deadly machinegun and humble rifle, there are many weapons to master. The battlefield is a dangerous place, and a little thought will help you stay alive - lead your shots, keep your eyes open, and be ready to engage in ferocious close combat at any moment. The development team is aiming to recreate the atmosphere of the Eastern Front with the same level of accuracy as in Verdun. Uniforms have been recreated to the tiniest detail, the weapons are modeled to exact references and the maps use realistic props and terrain layouts.